Have a great story to share or some fantastic photos that deserve to be in print? The USHPA Editor wants to hear from you! USHPA welcomes editorial submissions from our members and readers. We are always looking for well-written articles, photos and quality artwork. Feature stories generally run anywhere from 1500 to 3000 words. If your topic demands more or less than this, you should discuss options with the editor. News releases are welcomed, but please do not send brochures, dealer newsletters or other extremely lengthy items. Please edit news releases with our readership in mind, and keep them reasonably short without excessive sales hype. You are welcome to submit photo attachments, preferably jpeg files smaller than a megabyte. Review the Editorial guidelines for submissions of columns, feature articles and photographs. Calendar of events items may be sent via email to editor@ushpa.aero, as may letters to the editor. Please be concise and try to address a single topic in your letter. Your contributions are greatly appreciated. If you have an idea for an article you may discuss your topic with the editor either by email or telephone. Contact: Editor, editor@ushpa.aero, (516) 816-1333. USHPA uses an FTP dropbox to collect material for the magazine: Editorial Dropbox. To advertise in the magazine contact the USHPA Office at (719) 632-8300 or advertising@ushpa.aero. For more information, visit Advertise with USHPA. 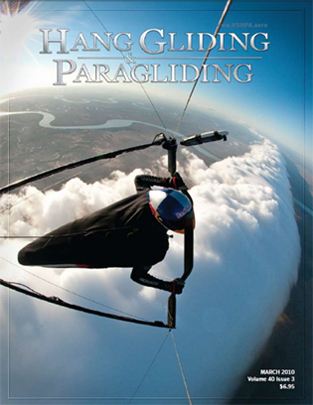 The USHPA magazine is published for foot-launched air-sports enthusiasts to create further interest in the sports of hang gliding and paragliding and to provide an educational forum to advance hang gliding and paragliding methods and safety. Contributions are welcome. USHPA reserves the right to edit contributions where necessary. The association and publication do not assume responsibility for the material or opinions of contributors. Editorial offices email: editor@ushpa.aero. Advertising inquiries: (advertising@ushpa.aero).